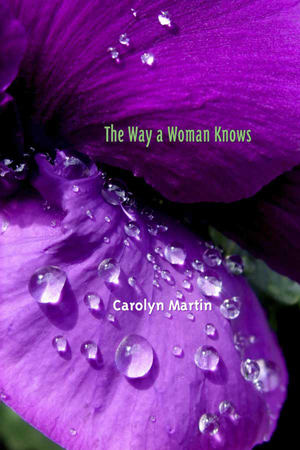 View cart “The Way a Woman Knows” has been added to your cart. 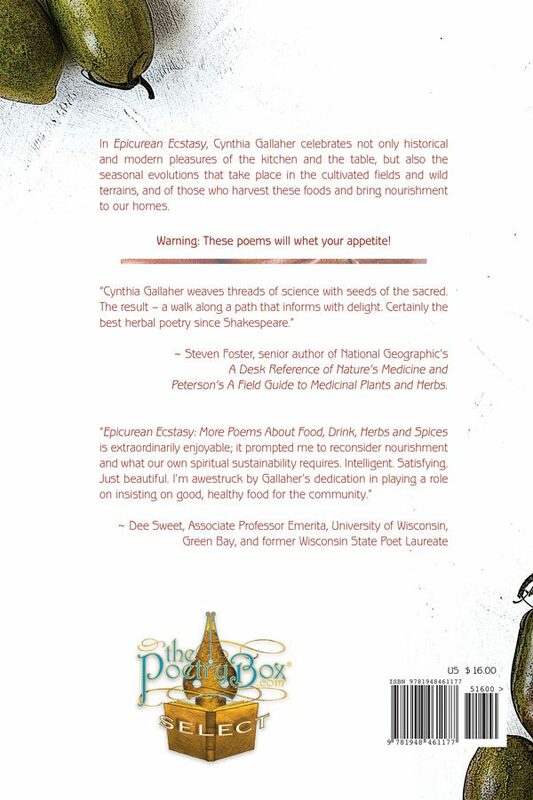 In Epicurean Ecstasy: More Poems About Food, Drink, Herbs and Spices, Cynthia Gallaher celebrates not only historical and modern pleasures of the kitchen and the table, but also the seasonal evolutions that take place in the cultivated fields and wild terrains, and of those who harvest these foods and bring nourishment to our homes. Epicurean Ecstasy is the larger sequel to Omnivore Odes, a chapbook of 22 poems which appeared a handful of years ago from Finishing Line Press. Thus, the “More” in Epicurean Ecstasy, with all new and a greater number of poems not found in the first volume. by sleepy workers hip-high in prophylactic waders. set loose from ancient-armored spaceships barrels. florid against the backdrop of thick snow. Cynthia Gallaher is author of three other full poetry collections: Earth Elegance, Swimmer’s Prayer and Night Ribbons, and three poetry chapbooks: Drenched: Poems About Liquids; Omnivore Odes: Poems About Food, Herbs and Spices; and Private, On Purpose. 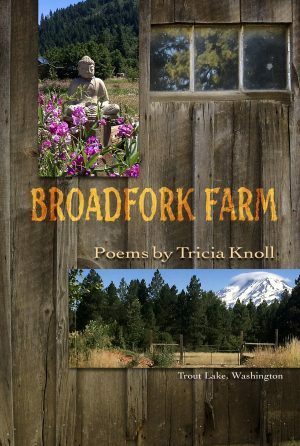 She also published the nonfiction memoir and reference Frugal Poets’ Guide to Life: How to Live a Poetic Life, Even If You Aren’t a Poet, which won a National Indie Excellence Award. Gallaher appears on Chicago Public Library’s list of “Top Ten Requested Chicago Poets,” and was named one of “100 Women Making a Difference” by Today’s Chicago Woman magazine for her writing and ecological work. She has also received numerous grants from the City of Chicago Department of Cultural Affairs and the Illinois Arts Council. Committed to the organic and sustainable foods movement, and a proponent of clean drinking water, Gallaher is a former officer on the board of directors of Illinois Consumers for Safe Food (a local affiliate of The Center for Science in the Public Interest) and has also served as a volunteer for Lake Michigan Federation’s (now the Alliance for the Great Lakes) Shorekeepers initiative and the Green Team of the Chicago Park District. She is also a certified yoga instructor and aromatherapist. Cynthia Gallaher weaves threads of science with seeds of the sacred. The result – a walk along a path that informs with delight. Certainly the best herbal poetry since Shakespeare. 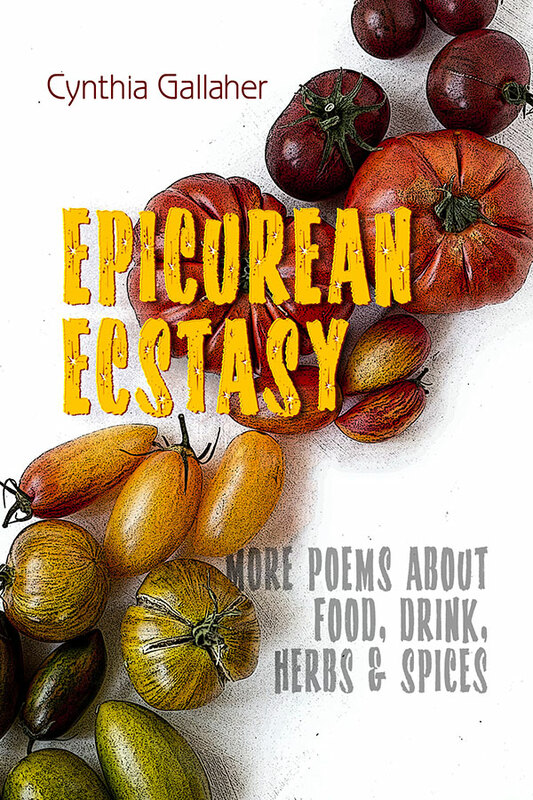 Epicurean Ecstasy: More Poems About Food, Drink, Herbs and Spices is extraordinarily enjoyable; it prompted me to reconsider nourishment and what our own spiritual sustainability requires. Intelligent. Satisfying. Just beautiful. I’m awestruck by Gallaher’s dedication in playing a role on insisting on good, healthy food for the community. I thoroughly enjoyed reading Epicurean Ecstasy. Not only was the poetry wonderful, but I learned a lot about certain foods and especially about herbs and spices. My favorite poem was “Found Champagne Poem in an Unclaimed Wisconsin Corner”. the chicken lays her egg. Overall, the poems are entertaining and enlightening. 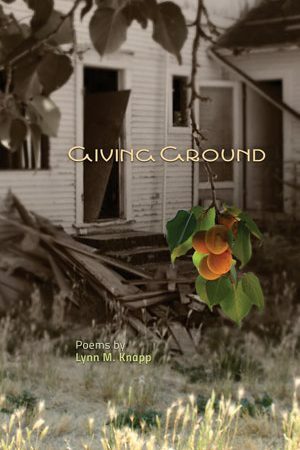 The choice of free verse for a collection which is light, but not frivolous, seems perfect. Forced rhyme on top of the easy-going tone might have lent a nursery rhyme feel, as it does momentarily when “The Irish Potato Famine” (page 54) unexpectedly dips briefly into and out of an abcb pattern. The risks of rhyme having been wisely sidestepped, as a reader I found occasional difficulties with the flow of some of the poems. In addition to a general absence of leading capitalization, there is an inconsistency in the use of punctuation, leading to a mix of very fragmentary and very long strings of clauses running across multiple verses, as in “All-American Blueberries (page 19). This is, of course, a function of the poet’s voice, and I know from experience that Gallaher reads her poems wonderfully to her audience. 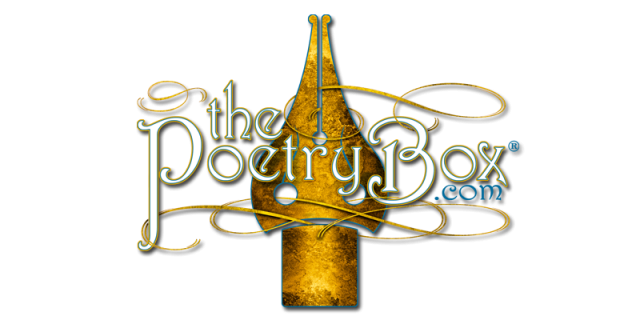 For the reader coming to these poems for the first time by way of the page, however, there are some slippery spots to navigate. 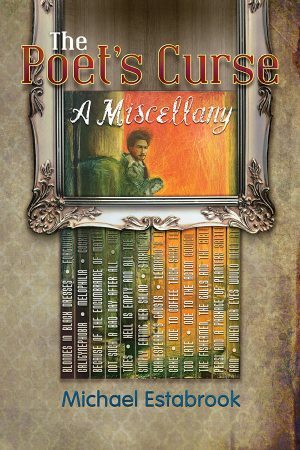 Absent in the tight focus on the specific subjects of Gallaher’s collection, and I think intentionally, is much in the way of human association with food. The reader is gently lectured, but there are no universal conclusions drawn. 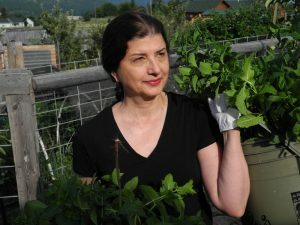 The few exceptions, such as the close of “Humble Onion” (page 60) and the beautiful “Sage, Cedar and Sweetgrass: Sacred Healing Smoke” (page 70) are noteworthy. This is not a shortcoming, and indeed might be the only practical way to approach the poet’s chosen task. Epicurean Ecstasy is a project at which Gallaher fully succeeds. Any reader wanting what might be thought of as the backstory or personal life of food will be amply rewarded. About the reviewer: Lennart Lundh is the author of sixteen books of poetry, two collections of short-fiction, and six works on military aviation history. His work has appeared internationally since 1965.